Youth, Outdoor Events, and Conservation - Thank You! With the river running high and dirty, we have taken advantage of the nice Spring weather to host and participate in some great events that support community, youth, conservation, and education. The Red's Rendezvous on April 22 got the ball rolling with a host of educational seminars. This event was well supported by some great fly fishing manufacturer's including Sage, Simms, G Loomis, TFO, OPST, Rio, Winston, and Redington, as well as the FFF, Project Healing Waters, TU, Hunting Works, and numerous others. A specific fundraiser that we hosted at the Rendezvous was a sporting clays tournament to benefit the Ellensburg Class of 2017. We donated the course, prizes, and staff support to the cause. A great time was had by all, and they were able to raise $450 in proceeds that goes towards the senior party! Thank you to all of the volunteers and our Red's staff members for another successful Rendezvous. We are already talking about next year's event! We'll be hosting a wingshooting/fly fishing event on September 30th, so mark your calendar. It will be the Red's Shootout III - YEP we are bringing it back! 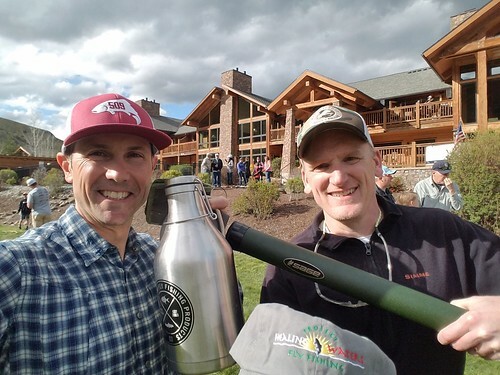 All of these events are the result of a tireless effort by those in the fly fishing and outdoor community to share their passion with others. We recognize that these new faces and young outdoors men and women will be our stewards and conservationists in the future, and they are essential to healthy resources. We appreciate the effort made by all. We also want to invite anyone that can attend a special dinner and fundraiser for a person that helped inspire Red's partner Joe Rotter at a young age. Jim Lane was a young and enthusiastic Hunter's Education instructor, more of a helper, during Joe's youth when he took hunter's ed as an 11 year old. Jim was the "young teacher" that was excited to not only help the kids pass the course, but to learn real information that will make them not only safe, but successful outdoorsman in general. Unfortunately Jim suffered a stroke recently and this has meant a life change for his family. Red's has donated a guided fly fishing trip with Joe Rotter to help raise some funds for his family to make the necessary adjustments needed for his wife Tanya and 12 year old daughter and his 15 year old son. Get a ticket to the event and bid that up for the Love of Jim! Anyway, thanks so much for the support you readers show us and know that we appreciate and give back to you guys as much as we can. Our entire team is very grateful to be able to work in the outdoor industry and we hope that you are encouraged and inspired by a few of the things we do here.